Година: 2019 13 x 53 мин. As Pilgrim\'s past comes into focus, Frank and Rachel find themselves in police custody, where they\'re anything but safe. It\'s not a trap if you know it\'s coming: That\'s Frank\'s philosophy. Madani opens up and Pilgrim plans a visit to an unholy land. Amy (formerly Rachel) develops photographs that point to a conspiracy. Russo reads his own report. Madani\'s story about Russo comes under fire. Madani\'s quest to ID Pilgrim hits a wall. Russo and his crew put their plan into action. Frank encounters someone from the past. Painful memories take ahold of Russo. Frank\'s frustration frightens those closest to him. Madani receives a visitor bearing a warning. 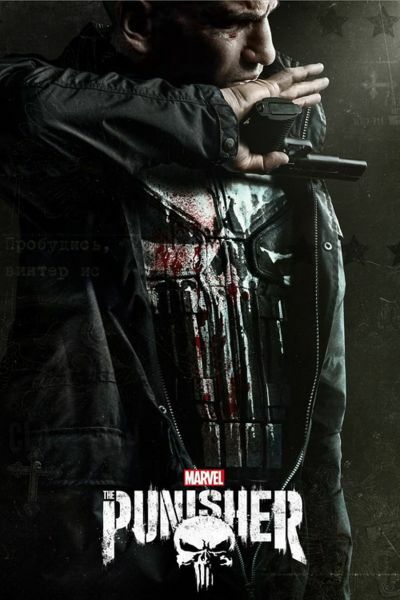 A big bounty inspires New York\'s worst to pursue the Punisher. A restless Amy seeks help from a fellow grifter. Russo and Krista consider the future. As Madani and Krista debate who\'s worth saving, Frank prepares to storm Russo\'s territory. A brutal encounter pushes Pilgrim back into old habits. Сериала е добър. Повече няма какво да се каже! Сериала е страхотен ! Заслужава си да се гледа ! Сериалът е добър, но се развива страшно мудно. Нямаше смисъл от 2/3-ти от епизодите. Историята се проследява само в първите три и последните два епизода. Много добър филм! Изгледах всички серии на един дъх.